The Runner can spend clickclick to break up to 2 subroutines on Ichi 2.0. 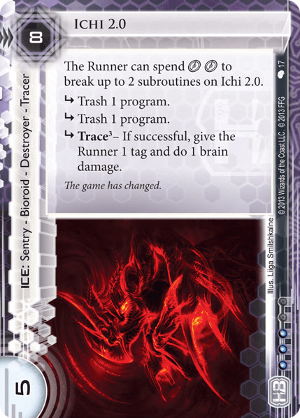 Compared to Ichi 1.0, the extra 3 to rez Ichi 2.0 gets you one extra strength, increased trace amount on the final by 2 for a total of trace 3, additionally the runner has less options for breaking since it must always use to break two 's instead of a single for each unlike most Bioroid ice including Ichi 1.0, so yeah you get what you pay for. Tyr's Hand: Sticking a surprised runner with any one of the s on Ichi 2.0 could potentially be a game ending event, or at very least put some momentum into the corps favor. Improved Tracers, again that extra 1 even on traces is not insignificant. Surprising the runner with insufficient s may result the runner's rig getting trashed in a devastating way, possibly swinging momentum into the corps favor. Like other 2.0 Bioroid ice, cost makes using this card riskier. Unless this card is getting installed with a combo or the deck has some stellar economy, this card will probably be looked over. At three influence cost it's also much less likely to show up in other corp decks. Often decks which feature Ichi 2.0 will only have 1 copy and perhaps 1-2 other heavy hitter ice which cost > than 6 and then feature a suite of cheaper ice for the vast majority of server protection.